Haven't had a chance to watch much of it yet, but Canadian journalist, and author of Among the Truthers, Jonathan Kay debates polyconspiracy theorist Webster Tarpley in a debate moderated by David Frum and filmed for CSPAN. Enjoy the looniness. I’m not sure I understand correctly the problem some of the people on this forum are having with CD (controlled demolition}. I wish someone would volunteer to explain it to me. Either I don’t understand what I’m looking at in the videos of the WTC being ripped apart by explosions or I’m just plain stupid, which I guess is not an entirely an unlikely possibility. Heh, you can say that again. Ronnie for the most part has confined himself to one thread over at TA, and it's a doozy. It just goes on and on for 25 pages, and after the first page or two, I'd guess that 95% of the posts are from Ronnie himself. If there is some doubt about CD (not music), then that seems to me to indicate that someone may have made all this crap up. Is Richard Gage lying? Is Dr. Jones lying? Does it mean that they all lied about the supper nano thermite being found in the dust? If they did, we are all in deep, deep, deep, deep, deep dodo, and I personally don’t care to be in any kind of dodo. He has an unfortunate tendency to play to his conspiracist fan-base, and certainly he is wrong at times (as we all are), but I don't think he lies. I've always been skeptical of the nanothermite claims and I felt that the Jones team did not take sufficient pains to distinguish their chips from ordinary paint, but though Dr. Jones may prove to have been wrong I see no reason to think he was lying. The kind of public adulation Dr. Jones got from his admirers when he first started lecturing on 9/11 is very bad for a scientist's objectivity. Brian's always been skeptical of the nanothermite claims? And as for the question of whether Gage lies, Oystein points out the ridiculous dissembling that he did about the results of the Millette study, when he failed to mention that it proved that there was no nanothermite in the WTC dust. AE911T is at least mistaken, if not adding a second lie, when they imply with the expression "the primer paint used on the WTC steel" that there was only one such formula. There wasn't just one. There were at least two, and neither Millette nor Harrit e.al. have ever test any of the other WTC primers, and thus ruling out the chips are WTC primer has been fallacious. The first is that steel columns failing in axial compression afford the same resistance (capacity) over the entire range of compaction travel as they do over the linear response range. They do not. A rough rule of thumb is an average capacity of 10-15% of peak capacity. If a column has a maximum capacity of three times the imposed load, it then would have an average capacity of 0.30 - 0.45x the load. Thus a load which already possesses sufficient momentum to overcome the peak capacity will experience a large drop in resistive force as that peak is passed, with the average resistive force giving a resulting average acceleration over the interval of between 0.55 and 0.7g. 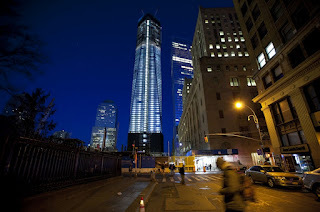 Pretty much what was measured for the early descent of WTC1! But that's only the early descent... and that's all Chandler measured. Other higher resolution measurements extending slightly further indicated a rapid decrease of acceleration magnitude immediately after that period, and later measurements of the WTC1 leading ejection front showed minor variation about a quasi-terminal velocity. Extrapolating a constant velocity from the measured region to ground level gives a collapse time of between 14 and 15 seconds. Therefore, there is strong reason to believe the overall collapse dynamics converged rapidly on dynamic equilibrium of the opposing forces and so zero acceleration. The second misconception is that the capacity derived from perfect axial alignment is available during collapse. The statements above concerning the load displacement relation for steel columns in axial compression apply to the ideal case of perfect end alignment. The capacity of a column is proportional to its cross sectional area. Lateral displacement of the upper block in the amount of only a few inches will in itself reduce capacity to a fraction of design maximum. You're one miserable troll Brian. You are STILL pimping that "circular argument" reproach while it has been debunked pages ago. A domino falls because a domino falls. Is that a circular argument? No, it isn't. Of course not. It's a simple cause and effect chain where each element is physically and positionally distinct from the element causing its demise. You pretend you haven't read or haven't been made aware of this rebuttal of your ridiculous fallacy allegation, because you mean to irritate. Because you're butthurt. Because this is your disruption strategy, because you're so "polite". How utterly pathetic. You're not polite, you're a cunning troll who has optimized his survival tactics. 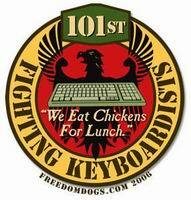 You've been repeatedly asked to back up your ignorant assertions and the AE911Truth talking points you parrot. You simply don't. You think you'll be just fine trolling. I asked a couple of additional questions two times now and you've ignored them too. You claim not to believe CD but you've made a laundry list of declarative statements which match the description of a Controlled Demolition believer to a T. Your sole reason for non-committal is plausible deniability should any of your spurious claims be proven unequivocally false, but you might as well let go of that tactic, because, as you've demonstrated in this thread, you'd lie about visual observations even as they stand facing you when you quote them in reply. A shameless liar of your caliber needs no additional insurance policies. I thought all along that it was a terrific book based on my knowledge of the subject matter. But it's a bit humbling to realize that everybody else has caught on. Congrats to Anthony Summers and Robbyn Swan. As I said when I read it originally: "Overall The Eleventh Day strikes me as belonging on the top shelf of the 9-11 books, right up there with The Looming Tower and Perfect Soldiers." A Pulitzer would put it right next to the Looming Tower. The admitted mastermind of a foiled plot to bomb New York City subways testified Tuesday that he wanted to fight jihad in Afghanistan after coming to believe that the U.S. government was behind the Sept. 11, 2001, attacks. The men had decided that complaining about American intervention in Afghanistan wasn't enough, he said. "We decided we were not doing our jobs," Zazi said. "We shouldn't just point fingers." At that time, he said, "My view was that 9/11, who was behind it, was America itself." Hat tip: ConsDemo in the comments. 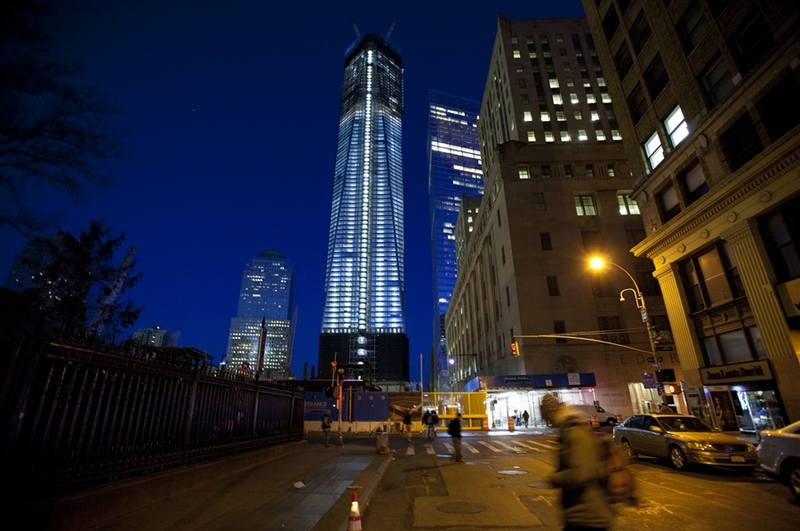 The new One World Trade Center rises from the ashes. More photos here. Hat Tip: Triforcharity at JREF. Charged along with Mohammed are Ali Abdul Aziz Ali, a Pakistani who is Mohammed’s nephew; Ramzi Binalshibh and Walid bin Attash, both Yemenis; and Mustafa al-Hawsawi, a Saudi. All are accused of playing key organizational or financial roles in the attacks on New York and Washington, a plot that Mohammed has said he masterminded. Over at Flogger, he specifies that he's not arguing that there were no hijackers; I suppose this is the old "No True Muslim" bit. 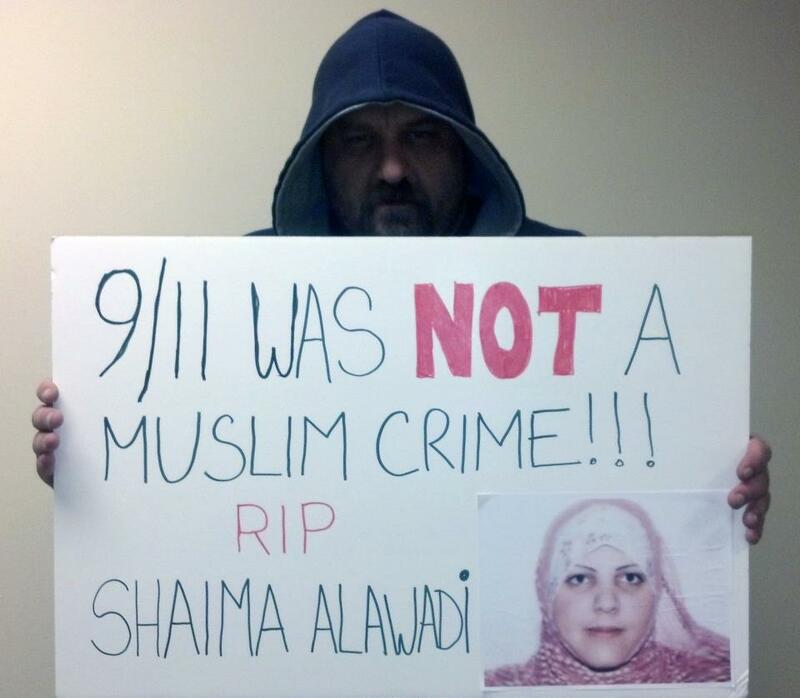 Shaima Alawadi is the Muslim woman who was murdered in San Diego two weeks ago. Of course, Jon's wearing the hoodie as a show of support for Trayvon Martin, the black kid killed in Florida over a month ago, whose death is being played out in the media (and about which I profess no opinion). Still, it's just a little too close to the "Muslims didn't do 9-11" line that Richard Gage and Kevin Ryan have been pushing. I'd like to see all three of them "man up" and tell us exactly what they mean. 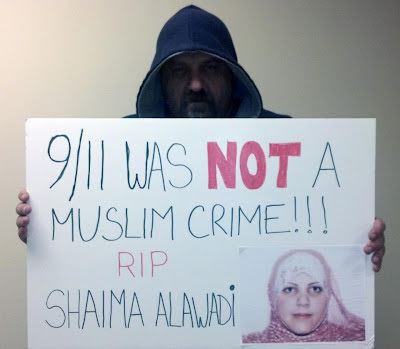 Do they believe that Mohamed Atta, Marwan Al-Shehhi, Hani Hanjour and Ziad Jarrah piloted planes into the WTC, the Pentagon and Shanksville, but they are not good Muslims? Or are they just being coy as usual about admitting their real kooky beliefs?